One of the favorite activities of our guild is collaborating on a group project. 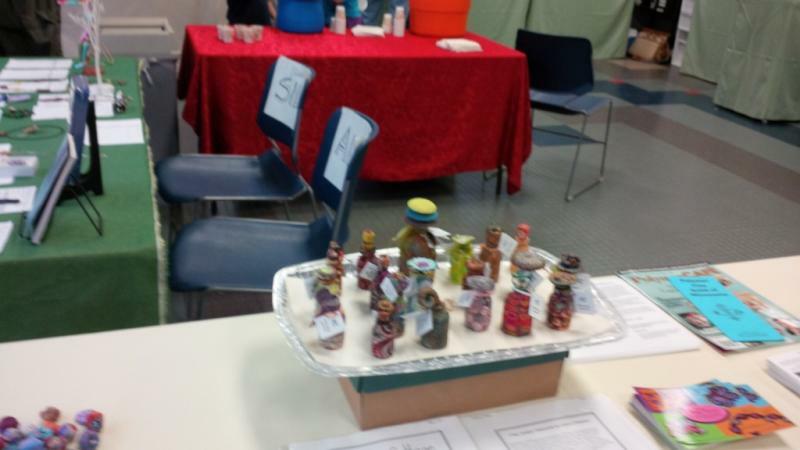 We choose a theme and a deadline, we bring our creations for "show and tell", and then we include the result of the group project as part of a public art display (public libraries, art galleries, Art-a-Whirl events, etc.) Below are pictures from some of the group projects and events in which I had the opportunity to participate since April 2010, when I joined the PCGMN. 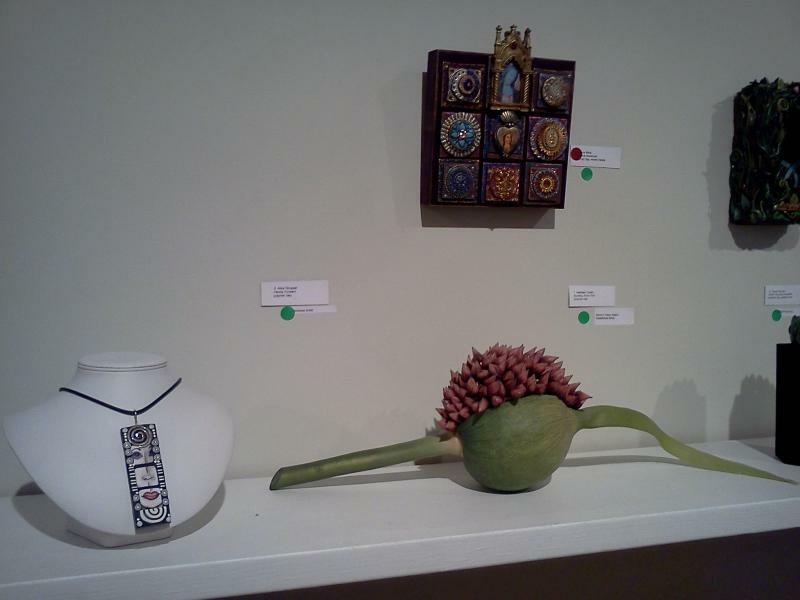 To quote Melissa Metzler, the owner of Flow Art Space: "Polymer Clay - Gallery Style - a rare exhibition of some of the finest polymer clay art being made across the country." The People's Choice Award - tie between Julie Johnson and Adam Rees. Melissa: "Congratulations to both! 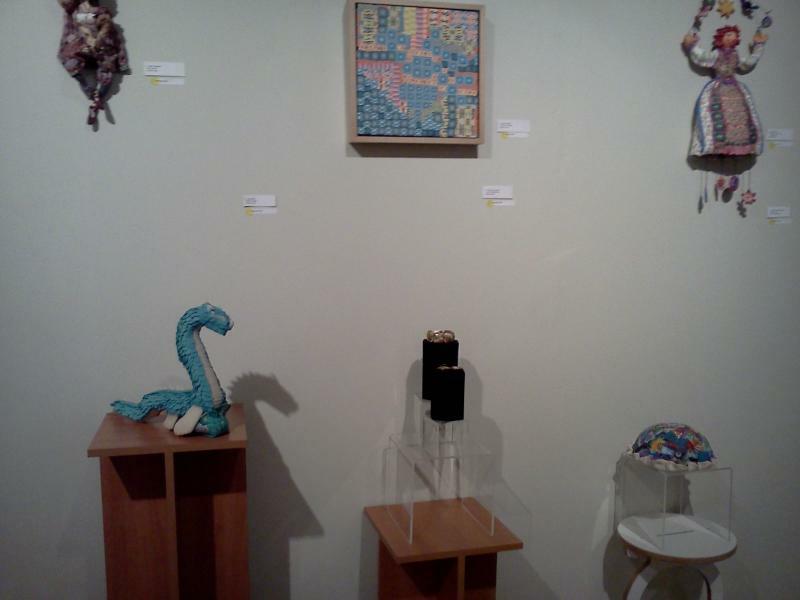 A total of 23 pieces in the show received votes, and several artists came within a vote or two of tying Julie and Adam. It was an exciting count to the finish!" 1st - Elissa Farrow-Savos, for "she felt so wrapped up in other people's expectations"
2nd - Kathleen Dustin, for "Bursting Alium Pod"
3rd - Adam Rees, for "Eyeing You"
Honorable Mention - Kim Buell, for "green movement"
1st - Linda Garbe, for "Box of Color"
2nd - Stephanie Etzel, for "Diary of a Firefly"
3rd - Christine Madsen, for "Home Sweet N.I.M.B.Y." 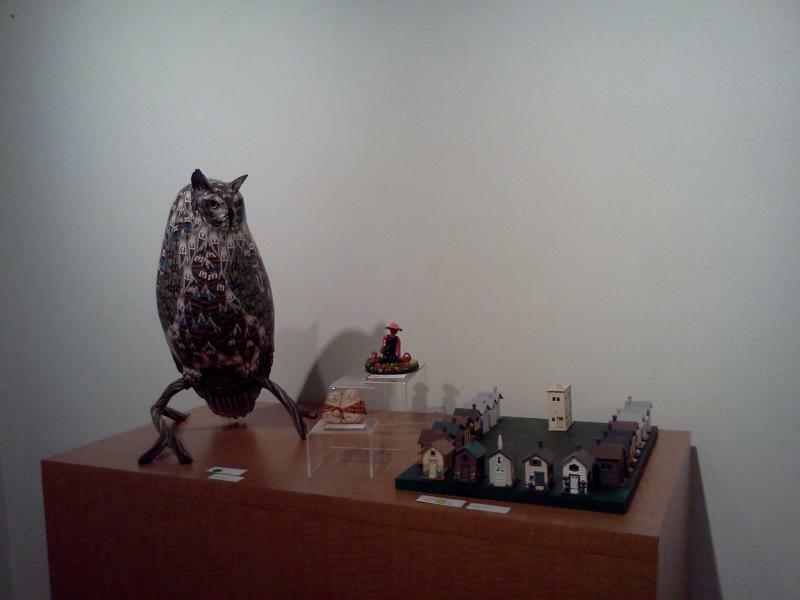 Honorable Mention - Laura Burlis, for "Landscape"
Established and Emerging Artist Awards judges, who were selected by members of the Polymer Clay Guild of MN, were Maureen Carlson and Kyle Fokken. 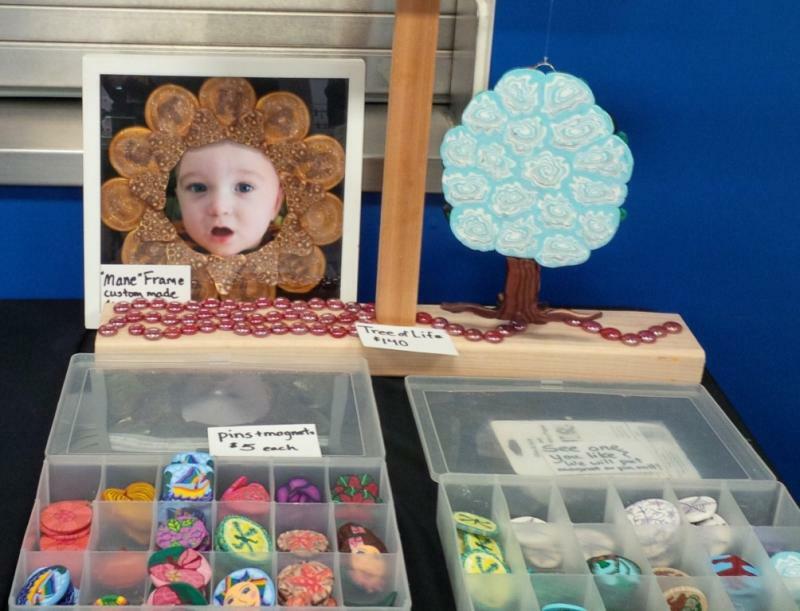 For the third year in a row, the Sheridan Women and Children's Clinic generously hosted our guild during the Art-a-Whirl event - May 17 through 19, 2013. 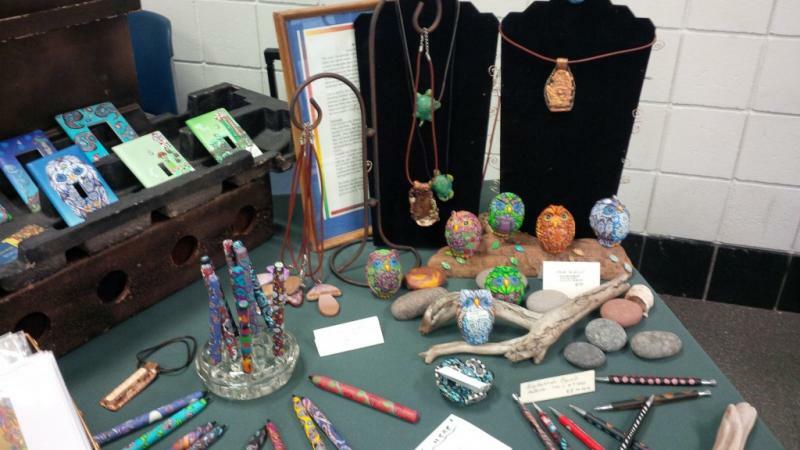 As always, we had two demo tables, refreshments, beautiful displays of individual work as well as group projects, and the guild member artists ready to answer any questions about their creations, about our guild, and about polymer clay in general. The most exciting event was the silent auction, which was probably anything but silent during the last few minutes of the bidding competition. 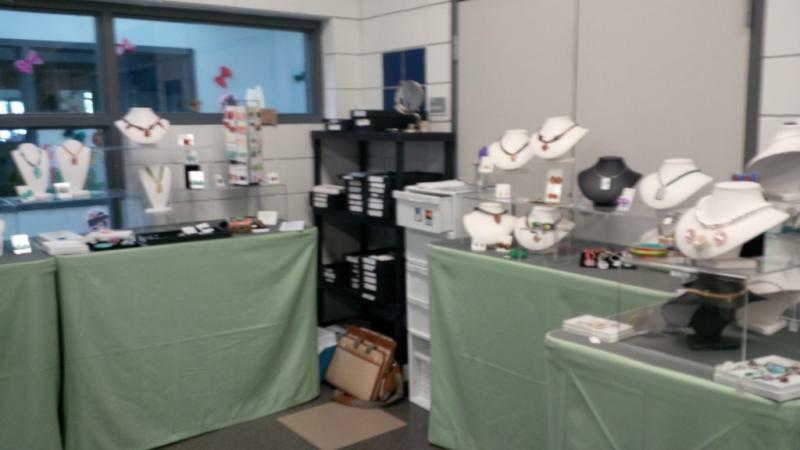 I hope your travels took you to our little corner of Art-a-Whirl, and now you will recognize some of the people and the displays in the photographs below. If not, make sure you do not miss us next year, too! As ongoing group projects, we decorate medicine bottles and donate them to cancer patients, and we make and donate beads for children undergoing cancer treatments or suffering from eating disorders. 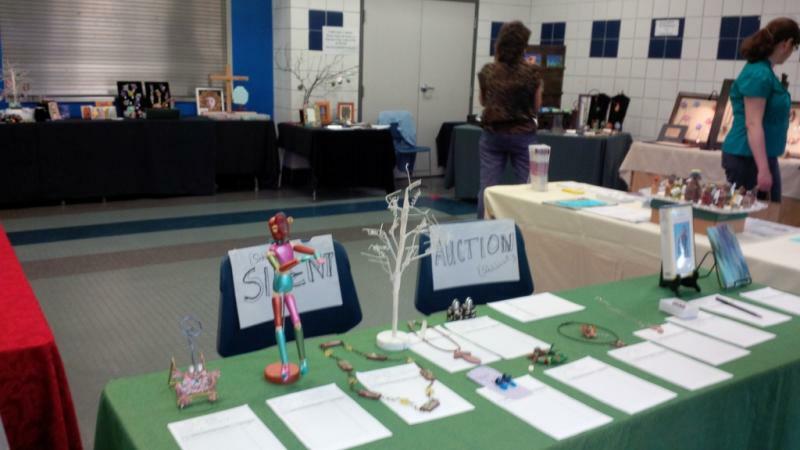 Every year, the Silent Auction table will have a selection of items donated by guild members. The bidding competition becomes very annimated during the last few minutes, and many times you can win wonderful objects at just a fraction of their value! You will rarely find Grace close to her own display, because she will be at the Demo table! 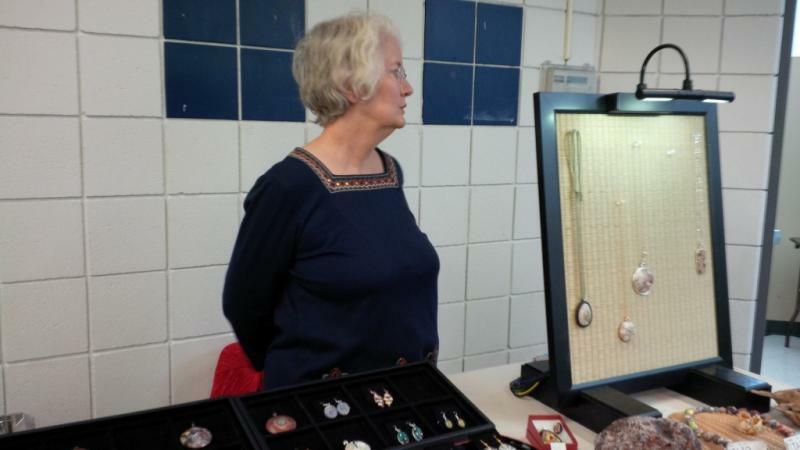 She loves to teach others how to use polymer clay to make jewerly, sculptures, or cover objects like bottles, pens, switch-plates. 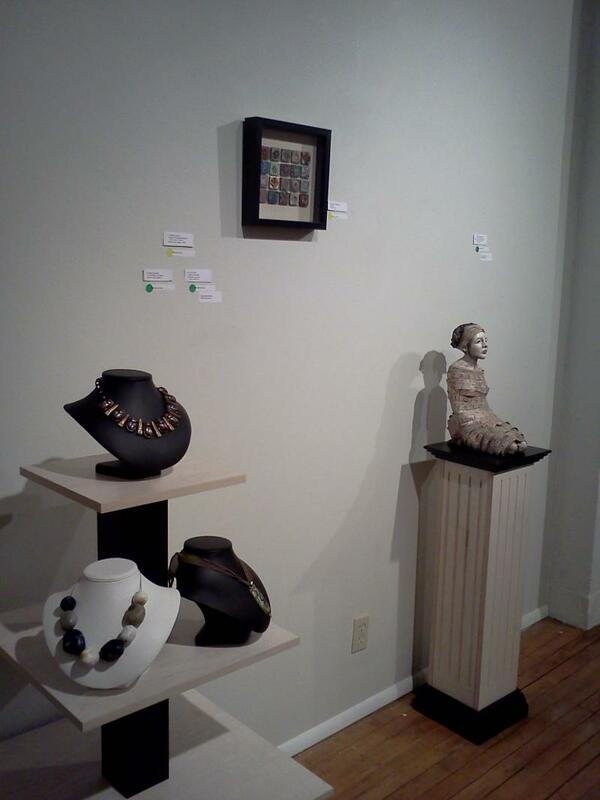 Come see her next time you visit us at Art-a-Whirl! In this picture, Eileen is wearing an apron with our guild's logo picture. 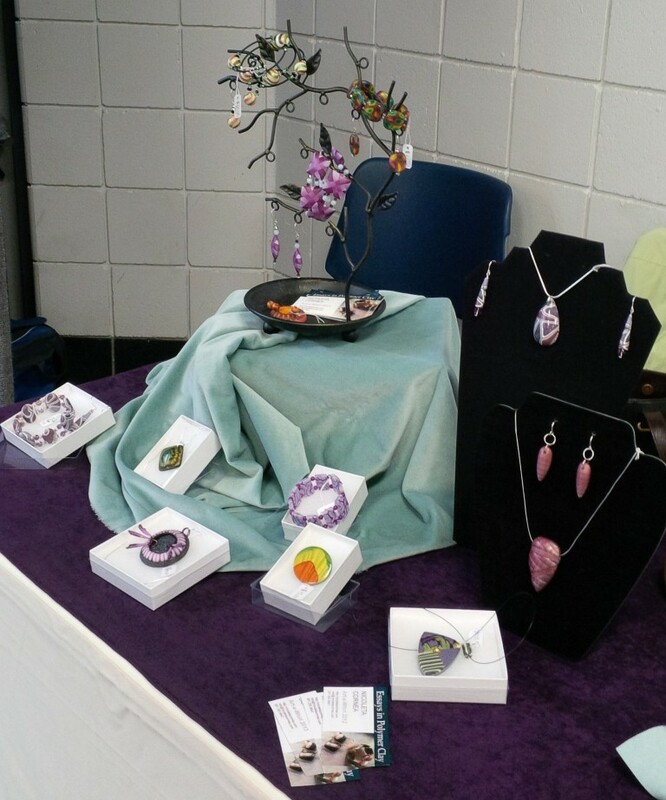 You can also glimpse at some of the beautiful jewelry created by Terry (left side of the table) and Eileen (right side). This is the third year in which I participate to Art-a-Whirl with a display of my work, and the fourth one in which I do demos, right next to Grace. I am sharing a table with Julia Meyer (see next picture). Julia's flowers are exquisite! 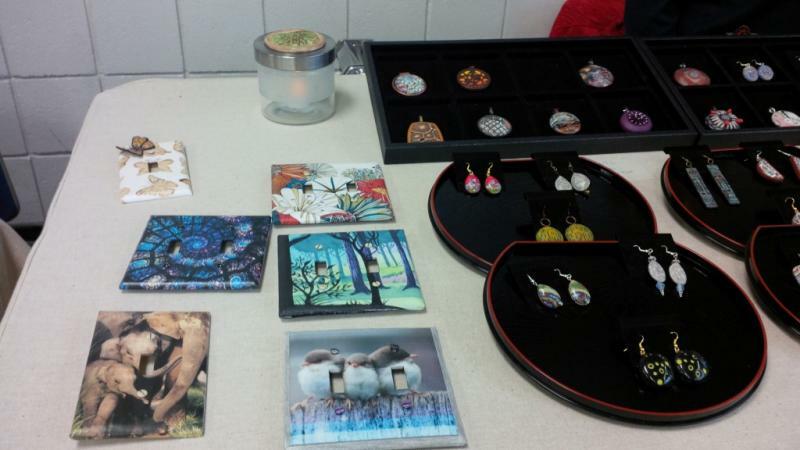 They come in all shapes and colors, and you can choose earrings, brooches, pendants, hair pins, and scarf pins. 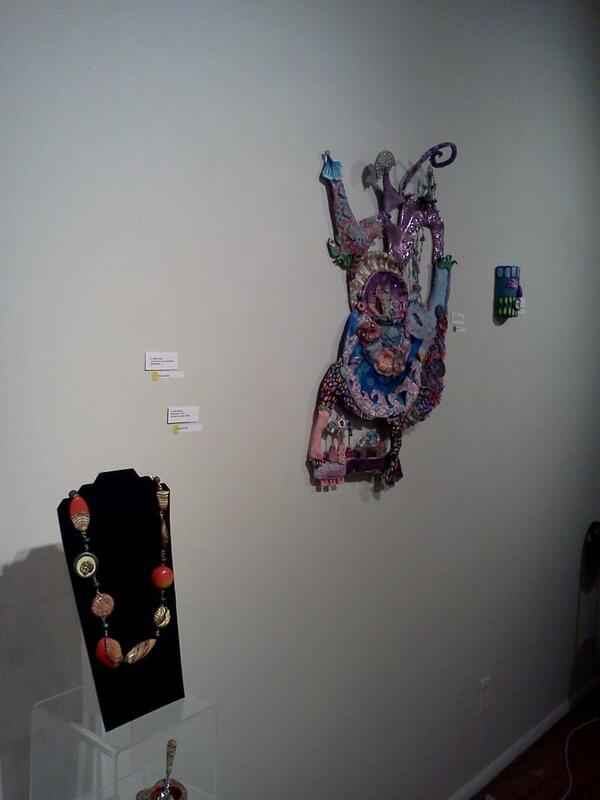 Laura volunteered to be our organizer for Art-a-Whirl 2013, and did a fabulous job with it! She co-ordinated the assignment of the various display spaces, the scheduling of the demo sessions, the sign-ups for different tasks throughout the event, and most importantly, helped me with the Silent Auction task - making all the important announcements. She knew exactly what to say and how, in order to encourage the bidding process. She turned it into an exciting and very engaging event, you felt compelled to be a part of it. Julie's corner was a treasure chest. 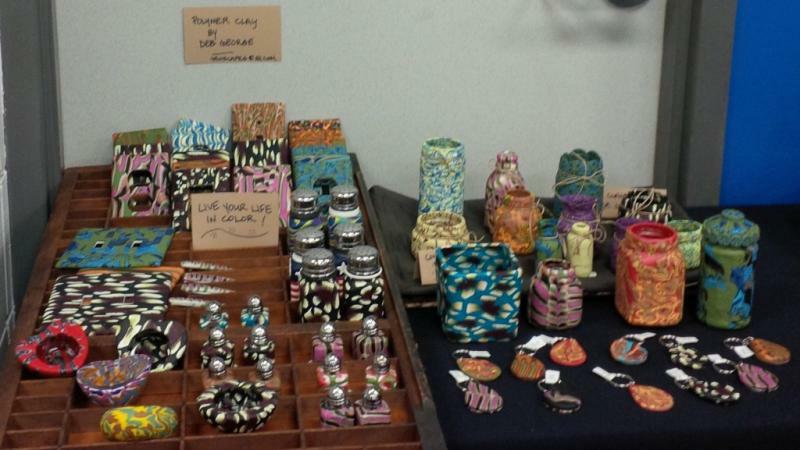 Here you can see kaleidoscopes, Wish&Worry boxes, bottle stoppers, pens. Check out the next picture for more wonders. 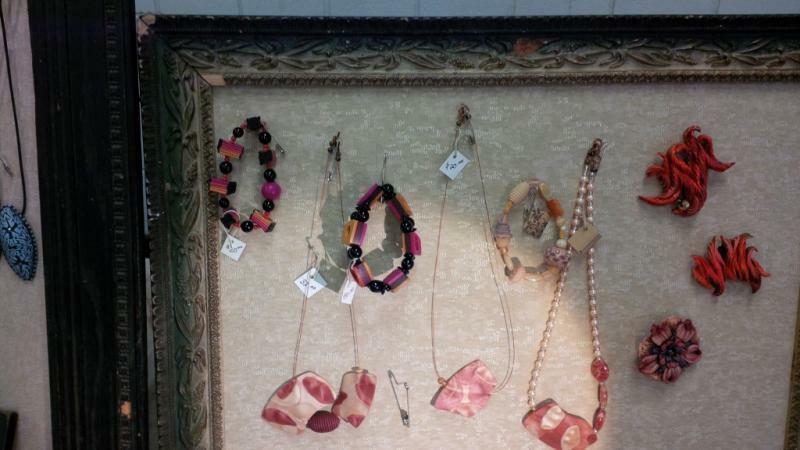 Julie's jewelry is so beautiful and varied that you have a very hard time choosing. You wish you could have them all! For more detailed pictures, you can check out her website: http://www.feat-of-clay.com. 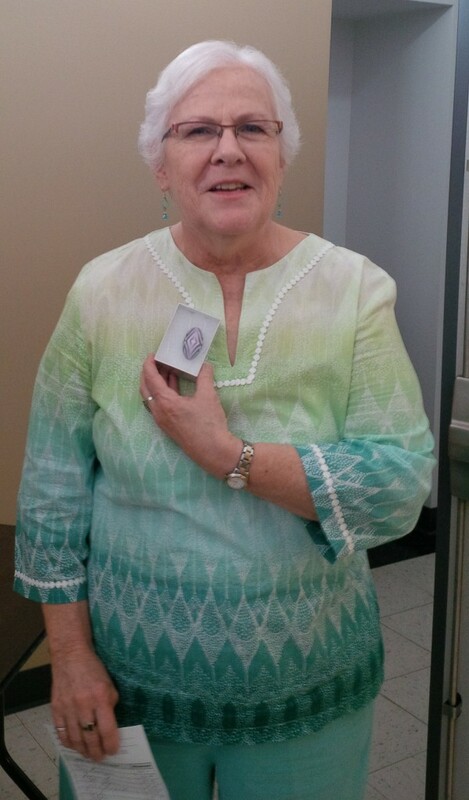 Deb George is one of the newest members of our guild. But you would not be able to guess that by just looking at her Salt&Pepper shakers or the decorated bottles. Amy has also joined the guild quite recently. Her creations are exquisite! I love her colors and the way she plays with them. I have my eyes set on at least two pairs of earrings - as soon as she decides to sell them, that is, this time around she only teased us with these beauties! Looking for a new pair of shoes? Or maybe just one, but with "piggies" and all? Karen has you covered. She had other cute creations, too: the crazy-hair-day ladies in the back, and the "babies in a pod". This year, Rosella had a stricking display, thanks to two very inspired creations - the "Mane" picture frame, and the "Tree of Life". 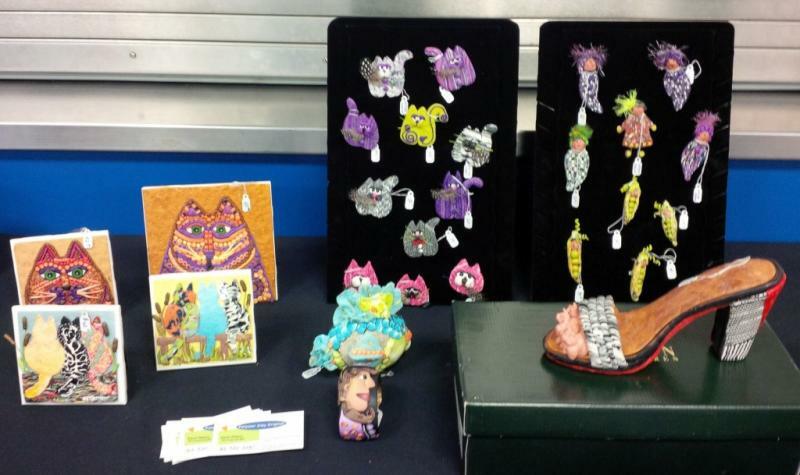 Laura is not only a perfect organizer, she is a very talented artist. 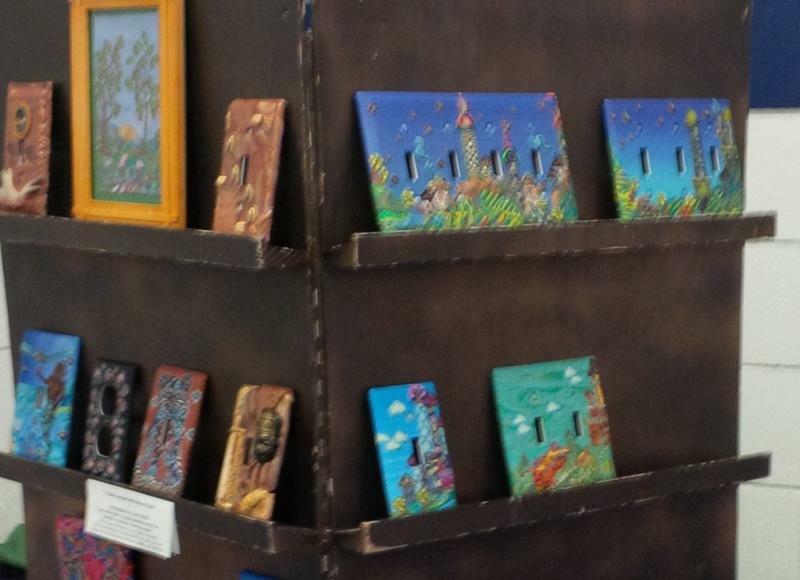 She is a master at turning discarded left-over cane ends or scrap clay into whimzical landscapes and portraits, with which she covers switch plates, eggs, pens, jewelry - for any and all tastes. Check out those owls, too! The standing ones are actually covered egg-shells. 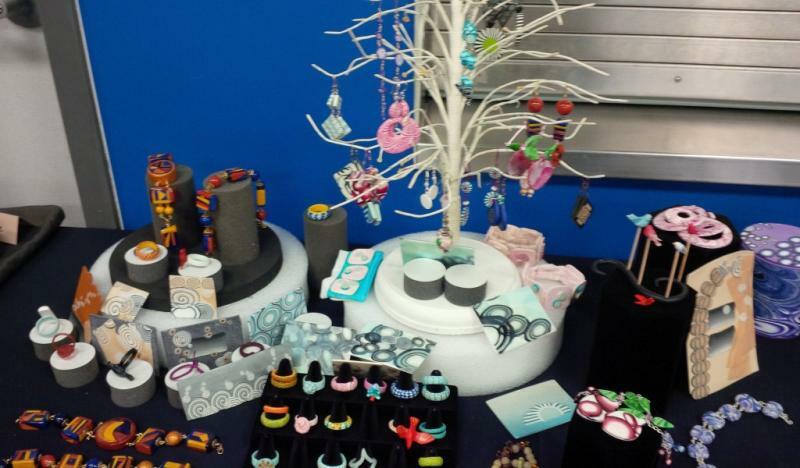 Beth's jewelry is something close to addictive - you just have to have one of them! 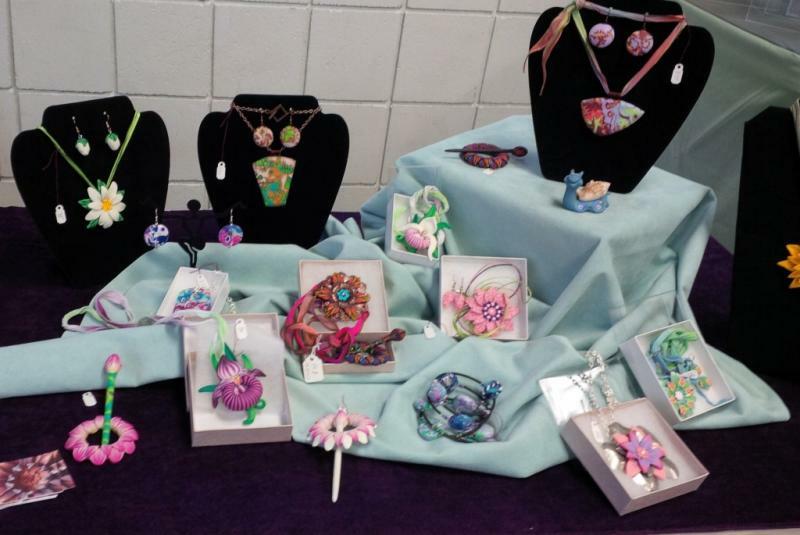 Or more than one... She mixes enchanting colors and combines them into perfectly executed pendants, brooches, and bracelets. 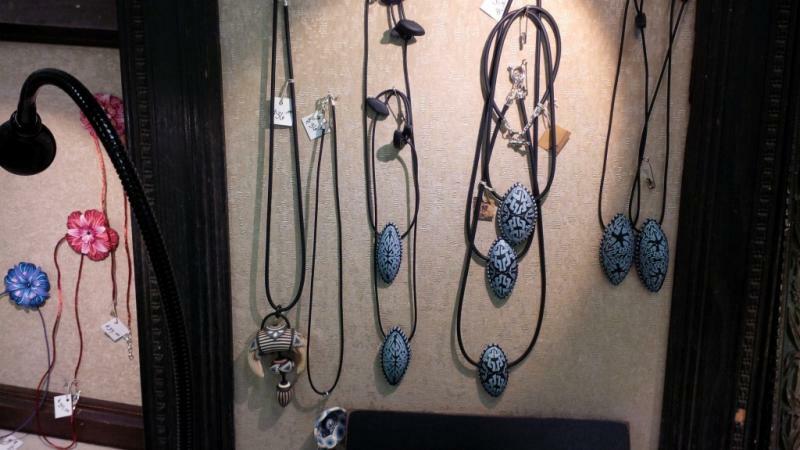 The black&blue celtic pendant in the center of this picture is now my daughter's. 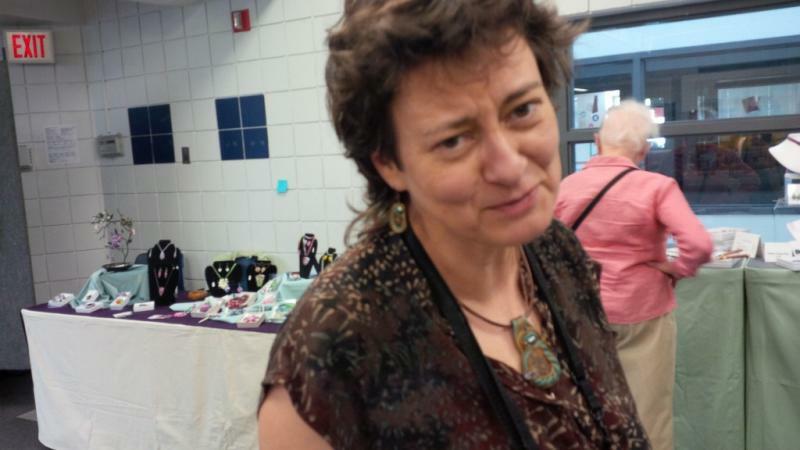 I have succumbed to the addiction of having one of Beth's jewelry at the very first Art-a-Whirl I attended (back in 2010, when I had just joined the guild, and I only volunteered to do some demos, but had no display of my own). 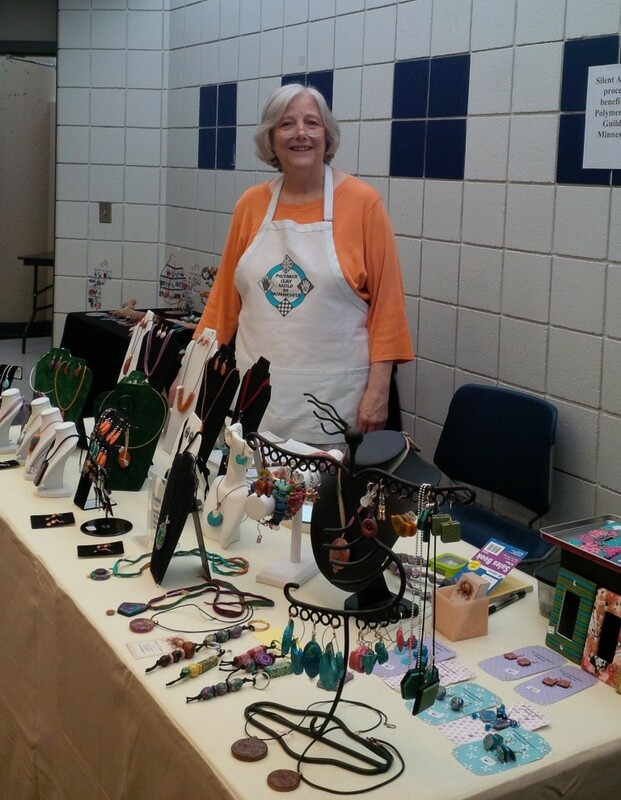 Since then, Art-a-Whirl means to me the chance of choosing another beautiful piece of Beth's jewelry that will become my own! Deb is another guild member whose jewelry I have the privilege to own and to wear. Her color palettes speak to my heart. Deb is a magician with textures and special shapes, and she generously shares all the tips and techniques that she uses to achieve those amazing results. 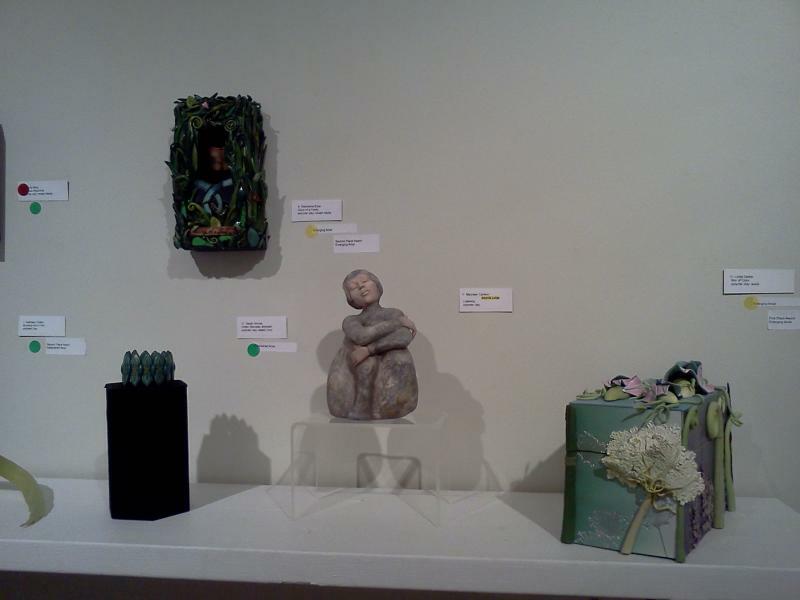 Here you can see another section of her display. 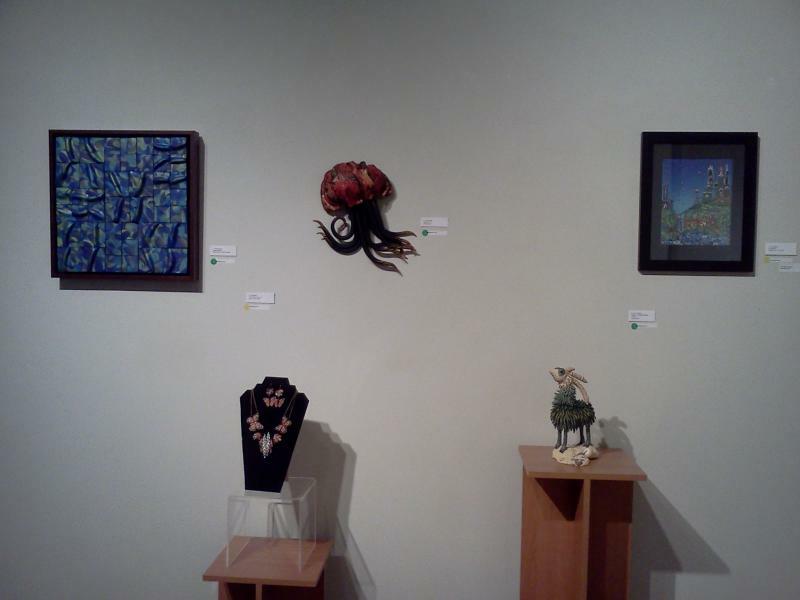 In the right lower corner, you will notice an object that looks like polymer clay barnacles on top of a huge clam shell. This year, the Silent Auction had a very thrilling result for me. I had donated the "No Worry" Pendant, and after a short but quite intense bidding war, Terry won the auction and the pendant. Thank you, Terry!